my little ones love to watch me draw and doodle in my art journal. so much that i let them add their own artwork. this one is by Buddy (age 5). he drew our family. i'm blue, princess is green, and he and hubby are orange. he also drew our cat and dog. the next two are by princess (age 3). the first one is daddy laying down in the grass. this one is me hugging andrew, and she is playing. i love seeing their drawings and hearing the stories they tell to me about them. last night i was hugging my little boy and he said, "mommy, i love you SOOO much i can't EVEN stop!" i just love my babies. sometimes i am so overwhelmed with love and pride in my children i can't breathe. being a mother is the most amazing thing in the world. one of the things my art journal has allowed me to do is reflect on myself in a different way. in a regular journal, of which i have stacks and stacks of, i mostly write about what i did, where i went, and how i feel about it. or i write pages and pages about how depressed i am. in my art journal, it's a different story--it's a story of me. i'm sure someone who read my journals would know a part of me, someone who looked at my art journal would probably understand me better. and i've begun to understand myself better, too. in high school i did a lot of self-portraits. mostly reflections on the inner turmoil i was dealing with--undiagnosed bipolar disorder, depression, PTSD, self-loathing and normal teenage angst, all wrapped up into one enormous dysfunctional 17-year-old. now that i am an adult, on appropriate medication, have moved on from the abuse and generally less dysfunctional, it is interesting to me to see the different way i am portraying myself. there are a lot more words, and a lot more colors involved. so who am i, really? a wife, a mother, a woman, an artist. these are all labels, all things i do--important things. but what's underneath that? i'm a person, i struggle with self-esteem. i don't really like the way i look. i think i'm witty sometimes, and i can be funny. i'm smart. i have artistic talent, which i am trying to hone. i am a creative person, and i'm outgoing. i love people. i'm generally an optimist, when i'm not struggling with mental illness. so the thing is....i'm made up of a lot of things. genetics. experiences. what i've seen, heard, and felt. what i believe. my convictions, ethics, and values. i change, i adapt, i learn, i grow. i'm not perfect, but i want to be better than i was, and better than i am. tomorrow, next week, next month, next year...i will be different--but deep down, still the same person. i, myself, am made of flaws. stitched together with good intentions. i'm sitting in bed. hubby is putting the kids to sleep, because he rocks. and because they take four times longer to go to sleep with me than they do with him. have you ever wondered what future people would think if they could see your house exactly as it is today? maybe like pompeii. modern-day archeologists try to figure out what life was like there before it was buried in ash. they'd have a heyday in my house, i think. there are no less than 10 pillows on my bed. in all different shapes and sizes. hubby has to have a million pillows. then he picks one to toss on my side of the bed (or on me) almost every night because it gets in his way. so then i end up putting it on the floor because it is irritating me. we also each have our own blankets. mine is a huge, fuzzy, thick blanket. his is a twin-size thin t-shirt blanket. he has a heater built-in and i freeze all the time. there are clothes hanging from every door in here. dresses, suit jackets, t-shirts, tank tops, sweaters, pants and polo shirts. a lot of our clothes can't go in the dryer. i no longer have a rod in my utility room so they get hung on doors. then left there until we wear them, or there is no more room on the doors to hang more. (because i HATE doing laundry.) and, although i gather dirty clothes nearly every day, the clothes i wore to work today are on the floor. next to my bed i have a make-shift night stand. the base of said night stand is the dog's crate, then a small three-drawer rubbermaid organizer. this organizer contains pens and pencils and markers of all kinds, a wii remote, rolos, my crossword puzzle book, my address book and a large quantity of bobby pins that i take out of my hair at night. on top i have a fork, a baby monitor, my phone (charging because the battery died), and a lamp. pinned to my lamp i have mini yarn zombie voodoo doll things. they are AWESOME. three of them, to be precise. plus my stuffed sally doll (from nightmare before christmas.) and my chloroseptic spray, because sometimes i just need it. hubby's side of the bed is a real mess. garbage, cups, forks and spoons, and phone chargers. plus buddy left a bunch of plastic mcdonald's play food over there, so it looks like mcdonald's threw up or something. combine that with my teddy bear, a book about training dogs (which i need to finish so i can train my spastic dog), half-full bags of pretzels and cheetos, toys, children's books, a wii balance board, empty gift bags, and boxes of craft supplies (paint, popsicle sticks, ribbon, glue sticks, felt, etc.) in piles all over. perhaps clothes are hung in a ceremonious "laundry hating" fashion. creative people can't keep their crap straight. you can tell the most about us, however, from what's hanging on our walls. there are two paintings i did of hubby and me hanging above our headboard. i spent a long time on these and i'm pretty proud of them. in general they turned out pretty well. one wall has a painting of a little boy with a drawing of the american flag and two firemen. it's a gift i got for hubby. next to it is a painting that belonged to his grandpa, who was a captain in the fire department in his city. the painting is of a horse-drawn firewagon. (is that the right word?) his grandpa's helmet is up there, too, and a photo of hubby's fire academy class. two of our engagement photos as well.....we took them on a firetruck. they're pretty awesome. the opposite wall is full of pictures of our kids, plus one buddy drew of me last year for mother's day, his handprint and a quote about motherhood. future-people now see that we are a family. we love our kids. we love each other. we love our history. 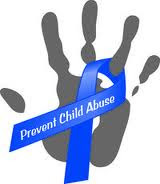 5 days into National Child Abuse Awareness Month! have you been wearing your blue? i am proud to say that i have worn a blue ribbon every single day. my manager and assistant manager have also been wearing a blue ribbon every day--which i think is really awesome. this is the first year i've had coworkers that have been willing to do that. my manager even let me put a little sign about stopping child abuse out on my desk--and pass out the pamphlets for 7 Steps to Protecting Our Children from Darkness to Light. how awesome is that?! 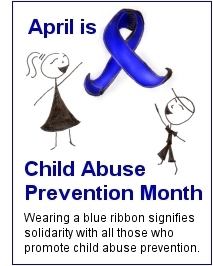 i love the way wearing a blue ribbon opens up opportunities to talk about abuse prevention. America is a country where all of us should be able to pursue our own measure of happiness and live free from fear. But for the millions of children who have experienced abuse or neglect, it is a promise that goes tragically unfulfilled. National Child Abuse Prevention Month is a time to make their struggle our own and reaffirm a simple truth: that no matter the challenges we face, caring for our children must always be our first task. Realizing that truth in our society means ensuring children know they are never alone -- that they always have a place to go and there are always people on their side. Parents and caregivers play an essential part in giving their children that stability. But we also know that keeping our children safe is something we can only do together, with the help of friends and neighbors and the broader community. All of us bear a responsibility to look after them, whether by lifting children toward their full potential or lending a hand to a family in need. Our Government shares in that obligation, which is why my Administration has made addressing child abuse a priority. Since I took office, we have advocated for responsible parenting and invested in programs that can give our sons and daughters a strong start in life. I was also proud to sign measures into law that equip State and local governments with the tools to take on abuse, like the CAPTA Reauthorization Act and the Violence Against Women Reauthorization Act. Together, we are making important progress in stopping child abuse and neglect. But we cannot let up -- not when children are still growing up looking for a lifeline, and not when more than half a million young people are robbed of their basic right to safety every year. So this month, let us stand up for them and make their voices heard. To learn more about ending child abuse and how to get involved, visit www.ChildWelfare.gov/Preventing. NOW, THEREFORE, I, BARACK OBAMA, President of the United States of America, by virtue of the authority vested in me by the Constitution and the laws of the United States, do hereby proclaim April 2013 as National Child Abuse Prevention Month. 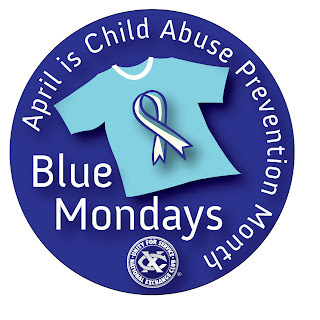 I call upon all Americans to observe this month with programs and activities that help prevent child abuse and provide for children's physical, emotional, and developmental needs. twenty-ninth day of March, in the year of our Lord two thousand thirteen, and of the Independence of the United States of America the two hundred and thirty-seventh. and don't forget...it's monday! wear blue! it's that time of the year again---april. national child abuse awareness month. 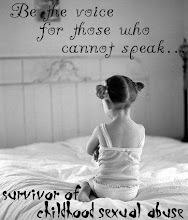 join with me to pledge to STOP child abuse! 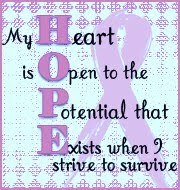 wear a blue ribbon in support. when someone asks you what it's for--tell them! 1 in 4 girls and 1 in 7 boys in the US will be sexually assaulted before they turn 18. LET'S MAKE IT STOP! Communication is key! Communicate. Educate. Intervene. wear BLUE every monday in april. that's tomorrow! vote for picture of experience! how about a plus sign? We have our cake, and we eat it too! So . . . . yeah. Kelly Derrick and Bryce too!